Join artist and musician Graham Dunning to learn different techniques to modify three vinyl records to create a mechanical techno composition. Learn about live sampling from records; optical trigger pattern disks and rotating physical sequencer to explore rhythm as pattern and fractions as beats. Finally, each set of three disks will be combined in the tower to create a playable machine-composition. You will get to keep the records you make along with a recording of your live composition. Graham Dunning is a self-taught artist and musician. His live work explores sound as texture, timbre and something tactile, drawing on bedroom production, tinkering and recycling found objects. Much of the work evolves through experimentation with different processes: considering the methods by which sounds become music; process as a continuum encompassing both improvisational and procedural methods; and testing analogous processes across different media. Graham has performed solo and in ensembles across the UK, Europe and Canada, and exhibited in the UK, Europe, New Zealand and USA. Rotondes is thrilled to announce that Actress, Graham Dunning – Artist and Sensu will make the Multiplica − Une exploration des arts numériques‘s opening night absolutely lengendary! Dubbed «one of the preeminent and most singular voices in UK electronic music» Actress produces his tracks by melding his obsession with textures, his devotion to Detroit techno and his unequaled beat-matching skills. Actress has also released some of the most widely talked about artists of the emerging bass generation (Disrupt, Zomby, Lukid and Starkey) on Werkdiscs, the label he co-founded. After performances at the Tate Gallery, the Barbican or the ARTE Concert Festival (but before Sónar Barcelona this summer) Actress will be in Luxembourg for one of his legendary, mesmerizing live shows. With “Mechanical Techno” Graham Dunning deliberately avoids the precision of computer-created music. His record deck is an installation that activates objects and instruments, leaving plenty of room for chance elements and turning sounds into perfectly imperfect music. Each set-up is unique, each performance is one-of-a-kind. Nobody will ever hear what you are about to hear! Sensu started out as an experimental ambient DJ, but refocused his ambition, adding club music to his palette. Originally influenced by the Berlin techno sound of the nineties, he quickly reached further, always choosing a less direct path to get his message across. Avant-garde and modern classical music are still close to his heart, a love often displayed in his eclectic DJ sets. Over the past few years, he has delved into disco and industrial music. This event is part of Multiplica − Une exploration des arts numériques. The festival is supported by ING Luxembourg and has Apex, excellence in sound, light & video as its technical partner. Rescheduled from last month, the event now takes place on Wednesday 27th February, at New River Studios in London. TOPLAP is an organisation founded in 2004, to explore and promote live coding. Celebrating its 15th year in doing so, a group of live coders are playing live shows across the internet (some from actual gigs in various places around the world) across 84 hours of continuous streaming. I’ll be doing my bit at 21:30 (UK time), playing using TidalCycles. My set will probably be some quite messy techno, breaks and 2 step. But totally improvised, starting with a blank page — so not sure what will come out. You can tune into the feed here, running from midday on 14th February. Available now from Front & Follow, the first album of recordings made with the Mammoth Beat Organ. Throughout 2018 me and Sam Underwood built a semi-automated noisemaking fairground organ. In August that year we spent a week in the studio making recordings with it – resulting in this album. While me and Sam worked together on the project, we decided to split each side of the tape by which module of the MBO was most used — one side makes more use of the wind sequencer, the other the rhythm unit. 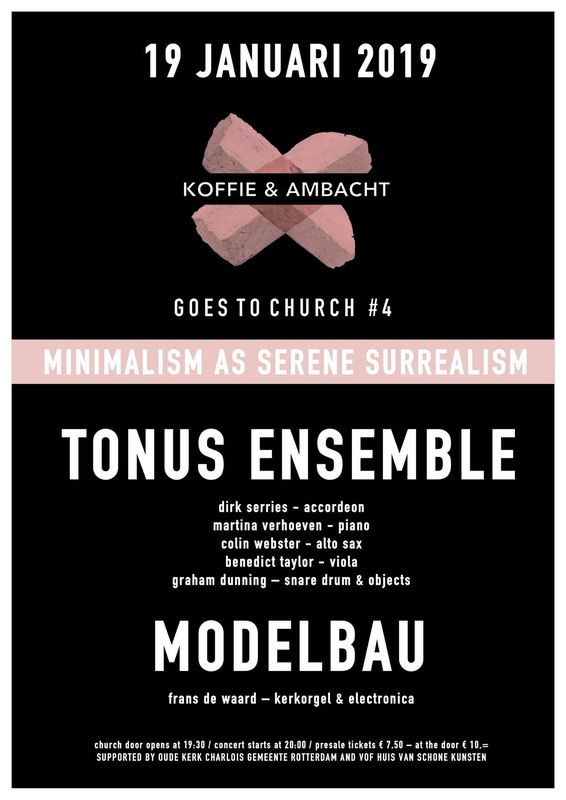 Tonus is a minimalist abstract music project by Dirk Serries with a changing lineup of musicians. I played with the group in 2018 for a studio session, Ear Duration, which is released on 19th January and available to pre-order now here. 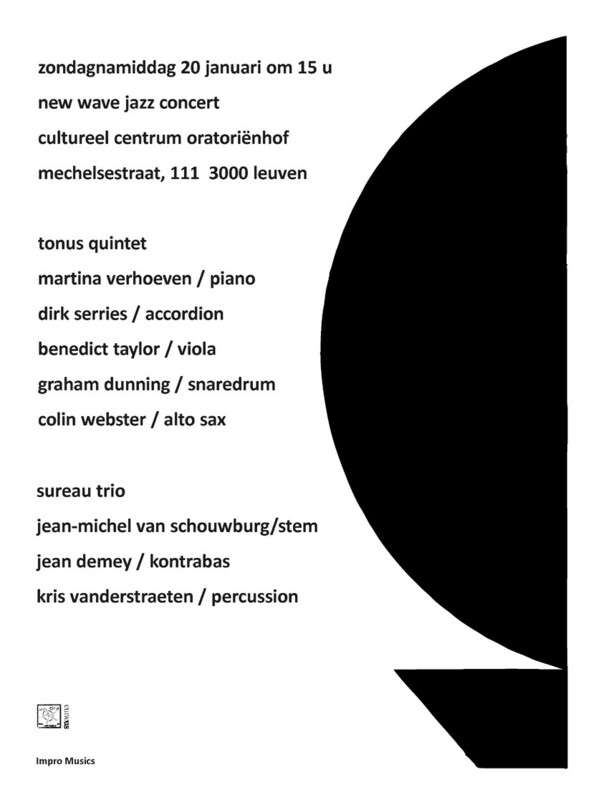 I’ll also play two shows with the group: January 19th in the old church of Charlois, Rotterdam (Netherlands); 20th at Oratoriënhof in Leuven (Belgium). The album Ear Duration is available to pre-order now here, released on the 19th January.